Get FREE Flower & Vegetable Seeds! If you are looking for an inexpensive way to give gardening a try without having to spend very much on your new hobby or to see if you'll like gardening, try growing an herb garden. Did you know that herb gardens can be traced back to medieval times when monasteries and nunneries would use them to grow needed medicines made from herbs? Somehow herbs began to make their way into every cooking and then particular herbs were being identified as being part of a regional cuisine. When you hear the word 'basil', you think Italian, right? When you hear 'cilantro', you think Mexican, right? or coriander representing India .. or Chinese parsley representing Asia when in fact cilantro, coriander and Chinese parsley are all the same herb. Herb gardens are making a comeback and many people are beginning to try their hand at growing these simple gardens. College students to folks living in apartments in NYC or Dubai are finding pleasure in growing herbs on window sills and balconies. 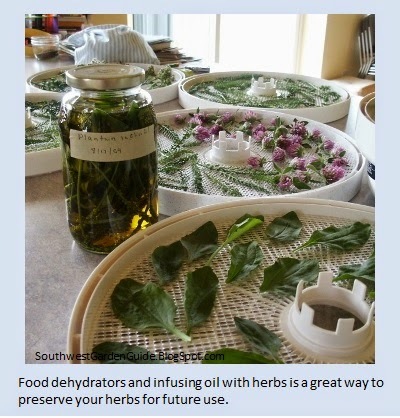 Growing a medicinal herb garden is just as healing as using them. The healing magic of medicinal herbs goes well beyond using them. You’ll understand what I mean once you start growing your own homeopathic herbs. Knowing that you have safe, reliable and powerful herbal remedies on hand is most empowering as a human being. Our ancestors did it and there's no reason why we shouldn't grow herbs for medicine as well. Instead of going to the cabinet for an antacid just nibble on a few fennel or dill fronds. If you happen to experience an occasional indigestion after dinner, make some ginger or peppermint tea. How about that headache you've had all day? A wonderful lavender compress or a hot cup of chamomile tea will work wonders. If you need to have more focus at work or school, drink some homemade peppermint tea. It seriously works. Of course, if you have a reoccurring or serious ailment you should definitely contact a doctor. Did you know that Russia grows field after field of pot marigold specifically for medicine? It's used just like penicillin. Marigold in Russia is used just like penicillin. During the American Civil war, wounds were treated with Calendula to stop bleeding. During WWII, an English gardener named Gertrude Jekyll had donated a field of marigold to be used specifically for the war effort. Marigold helps fight infection. 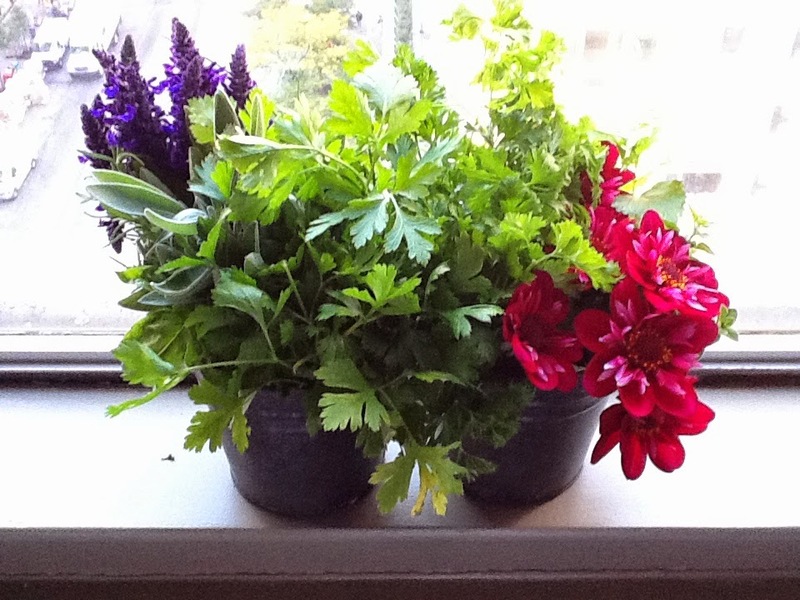 Growing herbs is fun, cheap and easy! Most herbs are annuals and can be grown in a vast garden to a simple growing pot. Did you know that herbs like most other plants have healing properties that have been used for hundreds of years as a medicine of some kind. Growing your own healing herbs is inexpensive fun and an effective home remedy to simple ailments. It’s a medicine cabinet sitting on your window sill. Most of the herbs you already eat have healing properties. It could be the reason why you feel happy around lavender, or your breathing feels better after eating onions or you sleep better after drinking your tea dried from you chamomile flower garden. If you already grow common herbs such as basil or cilantro then, you’re already growing a medicinal herb garden! Basil has many healing properties that can be used to treat arthritis, earaches, gum ulcers, upset stomachs. Cayenne Pepper can prevent stomach ulcers relieve tooth aches, lesson inflammation having to do with arthritis. Dandelion leaf, roots and flowers are used in herbal remedies as a diurectic to help lower blood pressure, to improve liver and bladder function, detox and can be used to improve the appetite. Echinacea or Cone Flower will boost the immune system to help against future illness. Ginger is great for motion sickness and nausea. Lemon balm makes uplifting tea. It will help clear brain fog. Oregano is used for fighting infections and treating respiratory conditions such as stuffiness, congestion and coughs. Peppermint eaten or made into a tea can provide relief for the common cold or flu (congestion, sore throat) and aid in digestion. Rosemary contains an above average amount of antioxidants and is useful for heart and respiratory health. Sage is wonderful for relieving hot flashes during women’s change of life and will sooth sore throats. Thyme is wonderful for clearing respiratory congestion. Herbs don’t take up much space at all. Most herbs rooting systems grow strait down and their foliage doesn’t expand out much. The more you clip the leaves and stems, the more they grow. Herbs are also beautiful to grow. Many backyard gardeners use them as an edible landscape for pretty walkways, fragrant blooms in pots and plant beds. Go outside and get a real good look at what’s growing on your property. Look in the grass, look in between plants, even look in the cracks of your sidewalk. Learn more about herbs and their healing properties and you’ll be amazed. It’s awesome what our forefathers had discovered all those hundreds of years ago. As the world industrialized, we all have relied on chemically manufactured medicines. Now there's a wonderful revolution of backyard gardeners exploring herbs not only for cooking but also for medicinal properties. 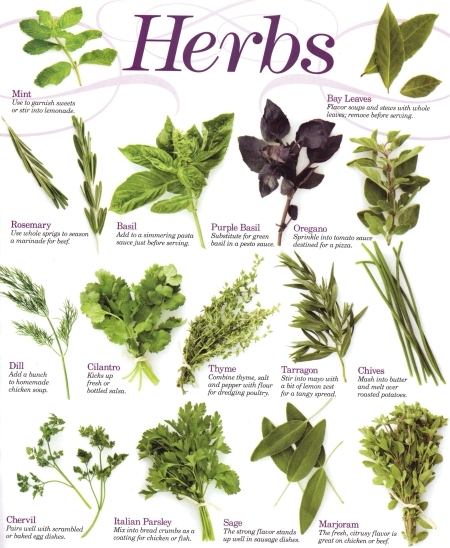 Herbs can be prepared for medicinal use as a poultice, beverage, bath soak, food, aromatic, etc. Did you know that flowers can contain medicinal properties just like herbs can? Besides being pretty and aromatic, particular flowers are tasty and herbal medicines. Lavender is well known for its mood changing properties, relaxation and aromatherapy. Yep, just the smell and looking at lavenders heavenly color can change your mood instantly. Purchase actual lavender plants for growing instead of seeds. Lavender seeds are difficult to germinate and plants are slow to produce mature plants. Johnny Jump Ups not only provide long lasting color in your flower beds but they also can be also be made into one of the best skin toner that soothes skin after a sun burn, used for bug bite irritation, make pours smaller and evens out the PH balance just like Witch Hazel does..
Chamomile soothes belly aches and truly promotes relaxation particularly if you need a sleep aid. German chamomile is a favorite plant to grow in a child’s garden and it’s so easy to care for. It doesn't need much attention while growing. German chamomile tea is the same tea that Peter Rabbit drank. 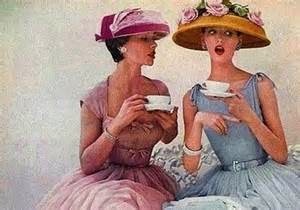 How much fun to have a garden tea party using the same tea you and your child grew! Calendula and Marigold are bright orange flowers which are excellent for skin care and stopping the growth of viruses and bacteria. They both can be made into a healing balm for diaper rash, chapped skin, bug bites etc. I’ve seen marigold used for a pink eye treatment and it worked. Dill is another great herb to keep around. 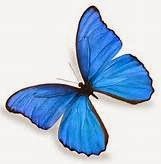 It soothes colic, helps with stomach aches, digestion, weight loss and attracts butterflies. The downfall to having dill you’re your garden is it will make you hungry for pickles. Grow a children’s garden with medicinal herbs to teach your young ones about the differences between plant healing properties. Children learn better by seeing, touching, feeling and creating. 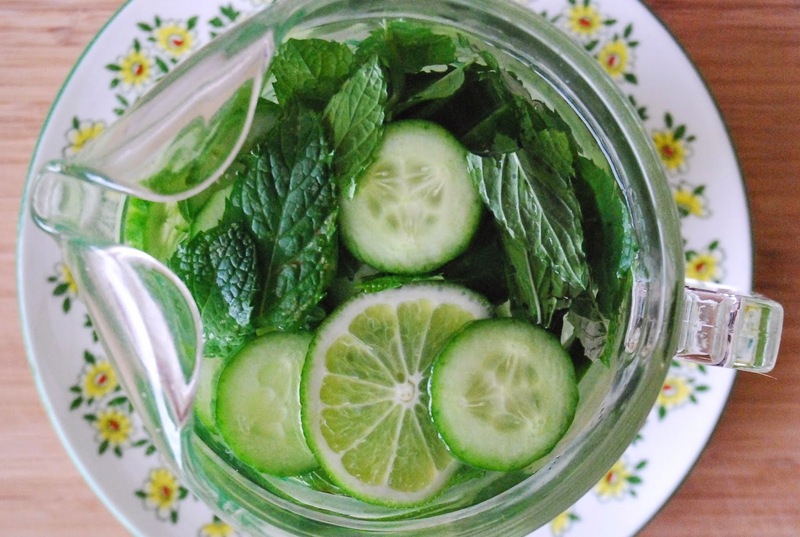 Herb and Fruit Infused Water (basil, lemon thyme, cucumber, lime). There are literally thousands of medicinal herb gardens. You may choose to have a particular garden plot just for herbs or you mix them among your vegetable plants for companion planting to ward off bugs and pests. Did you know that herbs also grow wonderfully next to your fruit? Berry bushes to citrus trees don’t mind growing side-by-side with herbs. Tomato plants are actually a fruit and they love basil, thyme and chive to ward get rid of aphids, mites and spiders. Fruits and vegetables are used in herbal medicine for healing purposes in modern medicine too. It’s not just an old wife’s tale sort of thing. Garlic will destroy bacteria and viruses plus, it wards off vampires. It can rid the body of many internal and external infections. All members of the garlic family as like chives, onions and shallots offer similar healing benefits. Juice from a hardy cabbage can aid in healing stomach ulcers. Raspberry leaves to enhance women’s health. 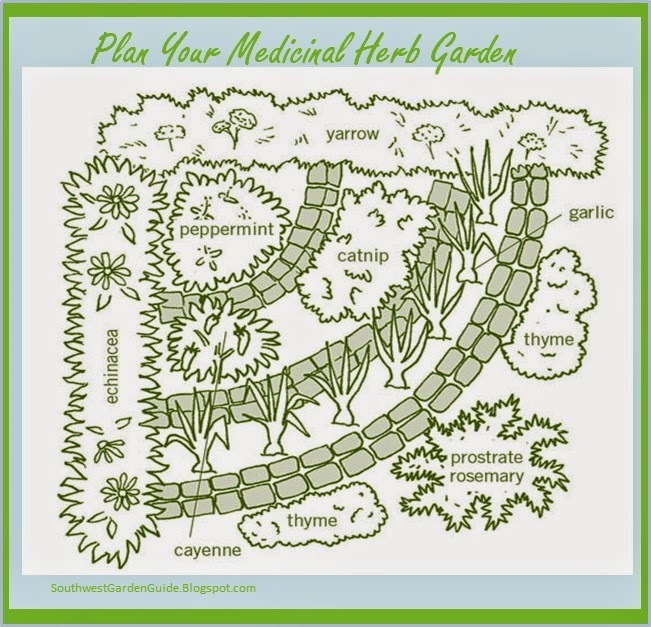 The most important aspect of choosing which medicinal herbs to grow is to know which particular herbs grow best in your hardiness zone and soil. Some herbs like heat, some like lots of water and like rich soil over simple dirt. It’s always possible to manipulate a plants original growing condition but, you’ll be more successful if you choose plants that will definitely thrive on your property. If you choose to grow herbs that just won’t grow well on your property and you don’t feel like amending the dirt, changing your watering habits , the I recommend to just the plants in containers. You can put the container anywhere indoors or outdoors. Medline Plus website is a service of the U.S. National Library of Medicine. It’s an absolutely amazing website and a great American secret. 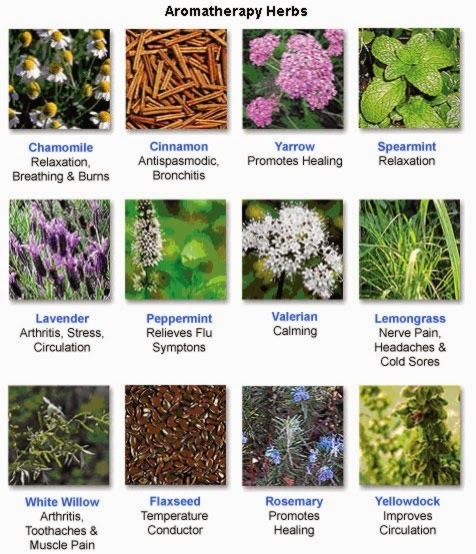 Aromatherapy Herbs are beautiful and easy to grow! Read the individual herb seed packet or tag to determine the right growing conditions for the herbs you have selected. The majority of herbs like a normal loam with a neutral pH. Most medicinal herbs grow best in soils that are neither too dry nor too wet and sunny a location. The funny thing is, around the world, many people consider herb plants found in their yard to be weeds until they grow them for culinary purpose. Cilantro and tomatillos grow wild on my property. It’s funny that I have a garden plot that I grow Burpee brand of cilantro. Every now and again when I need to make a large batch of salsa or grill using cilantro, I’ll go around my property scavenging for more cilantro. I save seeds and so, I usually just replant the original Burpee seed. If you want a faster harvest you can choose small plants rather than sowing seeds. I usually purchase seeds and start my own plants in containers then transplant them when they’re about 4 inches high. The benefit to purchasing plants from Lowe’s, Walmart or Home Depot is that they guarantee their plants. Consult your store’s buying guide just in case your plants die after a few weeks of transplanting them. Most herbs are available and cost a few dollars. The larger the plant the more expensive it is. Unusual plants can be ordered by the store’s manager or customer service if not, you can order via postal mail or internet. Find The Right Technique and Your Hooked On Herbs! Yep. Most herbs can be frozen for future use. It’s very convenient and the flavor will be good for a few years as long as they don’t get freezer burnt. 1. Separate the leaves on a cookie sheet preferably lined with parchment or wax paper. Make sure to not to over layer leaves. 2. Place cookie sheet in freezer for a few hours. 3. Once frozen, place the herb leaves into a freezer storage container or freezer bag. I like Zip Lock freezer bags with the plastic zipper. They seem more reliable than the freezer bags that you have to pinch. The Flavor and Aroma Will Amaze You! Imagine your sauces and soups having more savory flavor. 1. 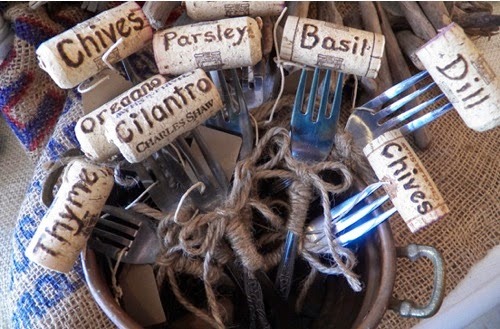 Pick your herb and bundle them with a cotton twine or string, metal twist ties or even zip ties. Don’t use rubber bands because, they’ll eventually give. I recommended creating smaller bundles rather than larger ones just in case the bundles fall apart. 2. Allow bundles to dry inside with good air circulation or they can be hung outside if you think it’s safe from birds, air pollutants or bugs. I have an old smoke house that I hang herbs from. I’m not a clinical type. As long as the dried herbs have been kept away from car emissions or bird droppings, I’m good. 3. To use, simply pluck off leaves or take the bundle in both hands and gently roll between your palms. *Herbs can also be placed in airtight containers. 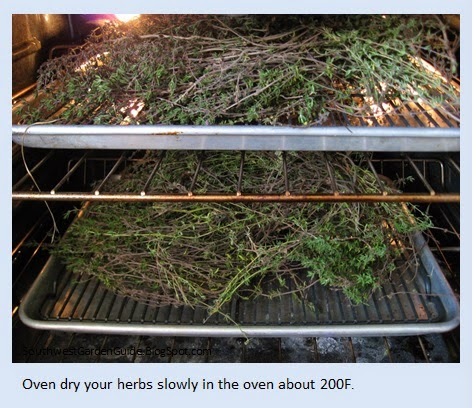 Drying herbs in your oven saves a lot of time and space. This is a great method if you enjoy growing herbs and live in a small home or an apartment. 2. 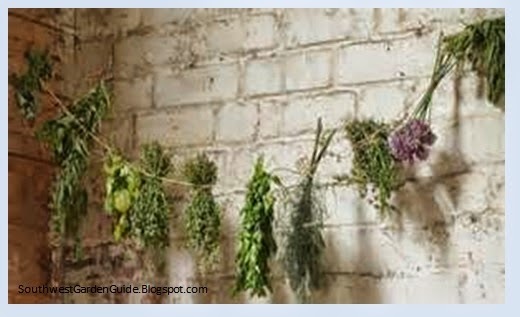 Bundle a small amount of herbs by using cotton twine or string or metal twist tie. If you plan on storing in air tight containers, you don’t need to bundle the herbs. 3. 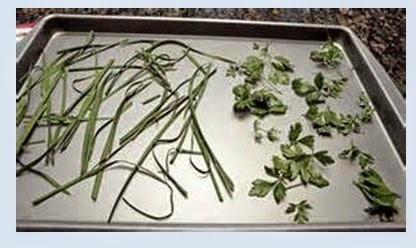 Place bundle of herbs on cookie sheet. Bake / Dry in oven for 1 – 2 hours. 4. Allow to completely cool before placing in air tight containers, paper or freezer bags. They can also be hung upside down for display. 1. Place a bit of water or chicken broth in an ice tray and stuff as much herb into each cubical. It’s ok if it’s over stuffed. 2. Completely freeze ice tray. 3. Take out of ice tray and store in a freezer container like a zip lock bag. 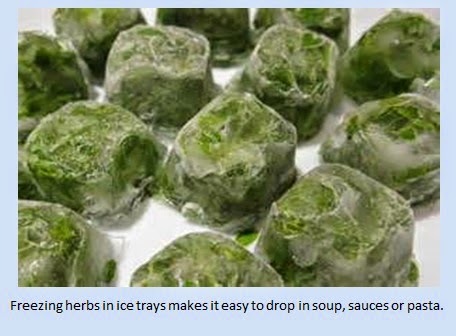 *Freezing herbs into ice cubes makes them easy to drop in soup, sauces or pasta. 1. Separate leaves from stems. 2. Dry according to manufacturer instructions. Usually 24 hours. Soups, sauces and even pasta will pop with flavor. 1. Stuff herb into bottle and fill with preferred oil. 2. If bottle already has oil, you'll need to empty some oil out in order to stuff herbs into bottle. Why Should You Have a Herb Garden? After you figure out which way you're going to even pronounce the word herb (herb vs. erb), you'll then need to contemplate what herbs are commonly used in your regular cuisines and which ones you'd like to explore. Do you want to cook with them, use them for medicines or perhaps use them for arts & crafts. There are a variety of great reasons to have an herb garden including medicinal uses, cooking, art, making extra money by selling herbs, tea, attracting butterflies, decorating, companion planting etc. Herbs have been used to improve health even before man discovered fire. There are various herbs that have been found to improve the health of the body as well as the health of the mind dating back to Neanderthal man. Growing herbs is much cheaper than purchasing them at Walgreens or CVS stores. A few pennies spend on herb seeds will definitely safe you a lot of money in what you would spend on particular vitamins, medicines, tea, hair color, aroma therapy items, spices etc. Ben Franklin said, 'A penny saved is a penny earned." He must have had an herb garden! Herbs grown for culinary purposes will definitely save you plenty of money at the cash register. Have you prices herbs lately at the market? Yikes. Many of us have held back from trying to cook ethnic dishes from around the world because, the recipe calls for a particular herb that's usually priced higher than our personal budgets allow. It's truly much cheaper to grow your own herbs than it is to purchase fresh herbs at your local supermarket. Growing herbs isn't hard to do either. Herbs make great additions to a variety of foods and enhance the taste without adding unneeded salt. Herbs will dress up any plate making any dish look like Julia Childs had stopped into to plate your dinner. 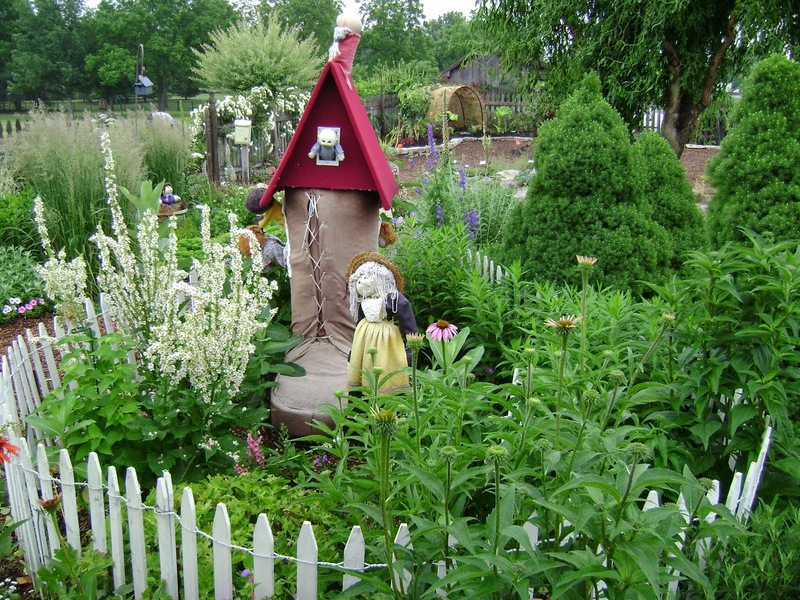 Another reason you may want to have an herb garden is for its decorative reasons. Herb gardens have long been used to bring aroma and color into areas on your property that need texture, color or fragrance. There's nothing like the smell of lavender or the pretty flowers grown on mustard. and if you are just getting started at gardening, an herb garden can be a simple place to start. Where to Plant an Herb Garden? The great thing about planting herbs is that you can either plant it in pots, fancy planters, recycled containers or you can make a garden plot in your yard. The sky's the limits as to how or where you wish to plant your herb garden. If you have limited space in your yard or do not have one at all, the pots and planters will be a great place to start an indoor herb garden. Most dollar stores have some great containers that are just waiting to be used as an herb harden. You can often buy terracotta pots at WalMart for under one dollar as well. Whether you decide to grow in indoors or outside, there are a few things to remember. 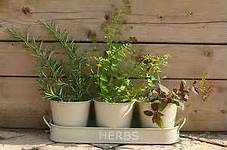 The number one thing to remember when growing herbs whether you're growing them inside or outside, is to be sure that your herbs are in a place where they get plenty of sunlight each day. If you keep them inside, make sure they are near a window with plenty of sunlight and if you have an outside garden. Pick a plot of land that gets sun for at least 6-7 hours each day. Also make sure that the soil is good and if not, you can add organic materials to make the soil more productive. 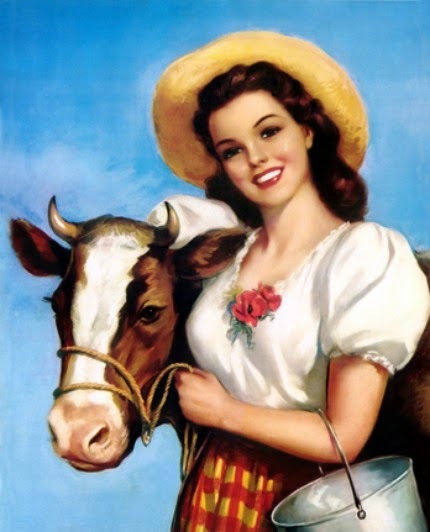 I never met an herb that didn't like a shovel full of cow or deer manure. Bagged manure, enriched potting soil can easily be found at any garden center for under $3. Most retailers have a house brand that's cheaper than the conglomerate bagged soil. 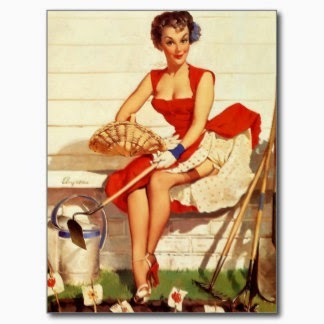 *Water is also essential to your herb garden, whether it gets rain outside or when watering inside. Herbs love manure tea or compost tea as well. Take a bucket or large plastic garbage can, fill 1/4 full of manure or refined compost and fill the container the rest of the way with water. Stir daily, let the manure/compost tea sit a few days before using. Each day you'll need to stir the compost tea to keep bugs at bay and keep the nitrogen active. Use it for all of your plants particularly herbs and vegetables. As you use the concoction, replaced the water and stir. Every now and again you'll know when to put more manure or compost into the container. Manure tea can also be used on houseplants by simply putting it into a spray bottle. If you stir the container daily, the water won't smell. Making a choice on what herbs to grow is easy. First choose herbs that you use in your daily cooking, then choose herbs that you would like to experiment when cooking, then choose herbs that you wish to help aiding health, decorating, art or what have you. I would recommend that your first choice of herbs be based on what's familiar to you before diving into unfamiliar herbs like borage or dead nettle. Start with basil, thyme, sage, cilantro, marjoram, bay leaves, chives, parsley, mint, dill, chamomile etc. If you want a decorative herb garden, you will want to pick the more attractive herbs like lavender, marigold, sage, rosemary, chamomile, evening primrose, lemon balm or even hollyhock. Herbs are beautiful, tasty and very useful to liven up our plates, our homes and our spirits. I'm telling you, having an herb garden is a complete joy. If you're new to gardening, an herb garden is right up your alley. You can have the pleasure of eating your herbs or just enjoying their simplistic beauty while you watch them grow and attracting anything from butterflies to birds. Whatever your reason for starting an herb garden, you'll definitely find yourself enjoying, bragging about and sharing your bountiful pleasure. *Listed are also some beneficial weeds and flowers that can most helpful to you in your garden to ward off bad bugs, attract good bugs etc. Bee balm Companion to tomatoes; improves growth and flavor. Borage Companion to tomatoes, squash, and strawberries; deters tomato worms; improves growth and flavor. Caraway Plant here and there; loosens soil. Catnip Plant in borders; deters flea beetles. Chamomile Companion to cabbage and onions; improves growth and flavor. Chervil Companion to radishes; improves growth and flavor. Chives Companion to carrots; improves growth and flavor. "Dead" nettle Companion to potatoes; deters potato bugs; improves growth and flavor. Dill Companion to cabbage; dislikes carrots; improves the growth and health of cabbage. Fennel Plant away from gardens; most plants dislike it. Flax Companion to carrots and potatoes; deters potato bugs; improves growth and flavor. Garlic Plant near roses and raspberries; deters Japanese beetles; improves growth and health. Horseradish Plant at the corners of a potato patch to deter potato bugs. Hyssop Deters cabbage moths; companion to cabbage and grapes. 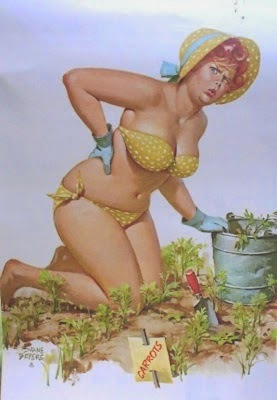 Keep away from radishes. Lamb's quarter's This edible weed should be allowed to grow in moderate amounts in the garden, especially in corn. Lemon balm Sprinkle throughout the garden. Lovage Improves flavor and health of plants if planted hee and there. Marigolds The workhorse of the pest deterrents. Plant throughout the garden; discourages Mexican bean beetles, nematodes, and other insects. Marjoram Here and there in the garden; improves flavor. Mint Companion to cabbage and tomatoes; improves health and flavor and deters white cabbage moths. Mole plant Deters moles and mice if planted here and there. Nasturtium Companion to radishes, cabbage, and gourds; plant under fruit trees; deters aphids, squash bugs, and striped pumpkin beetles; improves growth and flavor. Pigweed One of the best weeds for pumping nutrients from the subsoil; it is good for potatoes, onions, and corn; keep weeds thinned. Pot marigold (Calendula) Companion to tomatoes, but plant elsewhere in the garden, too; deters asparagus beetles, tomato worms, and general garden pests. Purslane Weed deters asparagus beetles, tomato worms, and general garden pests. Rue Keep it far away from sweet basil; plant near roses and raspberries; deters Japanese beetles. Sage Plant with rosemary, cabbage, and carrots; keep away from cucumbers; deters cabbage moth, carrot fl. Sow thistle This weed in moderate amounts can help tomatoes, onions, and corn. Summer savory Plant with beans and onions; improves growth and flavor and deters bean beetles. Tansy Plant under fruit trees; companion to roses and raspberries; deters flying insects, Japanese beetles, striped cucumber beetles,squash bugs, and ants. Tarragon Good throughout the garden. Thyme Here and there in the garden; deters cabbage worms. Valerian Good anywhere in the garden. Wormwood As a border, it keeps animals from the garden. Yarrow Plant along borders, paths, and near aromatic herbs; enhances essential oil production. Lemon balm creates a beneficial atmosphere around the property and inside any home. It's known to attracts bees. Part of the mint family. Marjoram has a beneficial effect on surrounding plants. Oregano has a beneficial effect on surrounding plants. Stinging nettle (Urtica dioica) helps neighboring plants to grow more resistant to spoiling. Increases the essential oil content in many herbs. Stimulates humus formation. Helps stimulate fermentation in compost piles. As a tea, it promotes plant growth and helps strengthen plants. Concentrates sulfur, potassium, calcium, and iron in its body. Valerian (Valeriana officinali) helps most vegetables. Stimulates phosphorus activity in its vicinity. Encourages health and disease resistance in plants. Chamomile (Chamaemelum nobile): A lime specialist. Contains a growth hormone which stimulates the growth of yeast. In a 1:100 ratio, it helps the growth of wheat. As a tea, it combats diseases such as damping off in young plants. Concentrates calcium, sulfur, and potash in its body. Dandelion (Taraxacum officinal): Increases the aromatic quality of all herbs. In small amounts it helps most vegetables. Concentrates potash in its body.